Three years ago, my father went to Al Hal market to work, a shell hit him and he died. Although Syria is a witness to an extensive history of war in the modern era, it wasn’t always a country in shambles. As hard as it is to imagine, Syria was once a country enriched with cultural and religious diversity. Majority of the population being Muslims, it was also home to a relatively smaller proportion of Jews and Christians. The country now seemingly a landscape of rubble, once had glowing towns and bustling marketplaces brimming with people of a rich culture. It boasts one of the oldest and most sophisticated literary traditions and the art of storytelling. Syria mesmerized the world with its ancient weaving styles, textiles and the architectural masterpieces that reflect the heart of their rich cultural heritage. This memory of Syria is an ancient tale that still rings through the hearts of millions of Syrians who have seen their homes and towns collapse, and seen the members of their family being given over to adversity and death. The Syrian war has been called the Greatest Humanitarian crisis since the World War II. These are the people who live not knowing whether they will be alive tomorrow. A great course of events has led to the current situation of Syria, one of the key factors being the installation of President Bashar Al Assad in the year 2000. Initially, this new, young and knowledgeable leader expressed his interest in listening to the people and acknowledging Syria’s need for reforms. He set up forums where people could discuss new ideas and express what they felt. It was the first time when Syrians were able to communicate the reality of their hearts and minds . Assad’s view of modernizing Syria involved adoption of neo-liberal and capitalist policies where, the trade and industry are controlled by private owners for profit, rather than the state itself. The imposition of neo-liberal policies and privatization exaggerated the inequality between the poor and the rich, which was especially felt in middle-class regions, and both mid-sized and large cities. While a small portion of the capitalists and loyalists to Assad were able to benefit from these policies, the vast majority of the population was disenfranchised. Assad’s ideas were opposed by the secular and socialist Baath Party that was in power before him. But what looked like a people’s government at first wasn’t in Assad’s plan. At the first hint of opposition, Assad tightened his forces and used mass repression, intelligence agencies and secret police to identify his rebels and enforce his commands. During the same time, the Arab World witnessed uprisings throughout the region in response to the years of dictatorship, political corruption, human right violation, unemployment, poverty and sectarianism at the hands of their leaders. This had a significant impact on an already infuriated civil condition within Syria. The people took to the streets with mass protests and indulged in civil disobedience, riots, insurgency and demonstrations. Their demands of democracy, human rights and economic freedom were met by overthrowing their leaders. Among these were – the Libyan leader Muhammed Gadaffi, Tunisian President Zine El Abidine Ben Ali and the president of Egypt, Hosni Mubarak. But as for Bashar Al Assad, the uprising led to an eventual full-scale civil war. Local rebel groups emerged in protest against the Assad’s regime in enormous numbers. One of such protests greatly remembered was held in the city of Homs. On the city’s main square under its clock tower, thousands of protesters gathered and vowed to stay up all night and set up tents like many other protests during the Arab uprisings. At the dawn of April 18th 2011, security forces stormed the scene and opened fire on the protesters killing dozens. Since then, Homs became known as – The capital of Revolution. The war has long been going on as the local rebels groups reorganised and took their stand against the regime after being supported and aided by several member countries of the UN. On the other hand, Iraq has supplied soldiers and military warheads to Assad to prevent the regime’s collapse. In this relentless fight of power, nearly 400,000 civilians have lost their lives. They have been shot, shelled, attacked by chemical bombs in the attempt of the government to rid the regions clear of the rebel groups. They have been forced to flee their homes and live in the harshest and the destitute conditions devoid of food, water, work and education. In 2016, United nations identified 13.5 million Syrians worldwide needing humanitarian assistance, of which 6 million are displaced within the country and 5 million are refugees outside Syria. The story of Ibrahim is just one among millions of Syrians. But it’s enough to understand how gravely the actions and decisions taken with selfish motives and pride can tear away a nation’s existence. What does this self-serving government have to show for the modernizing ideas they held to reform Syria when it came to power? 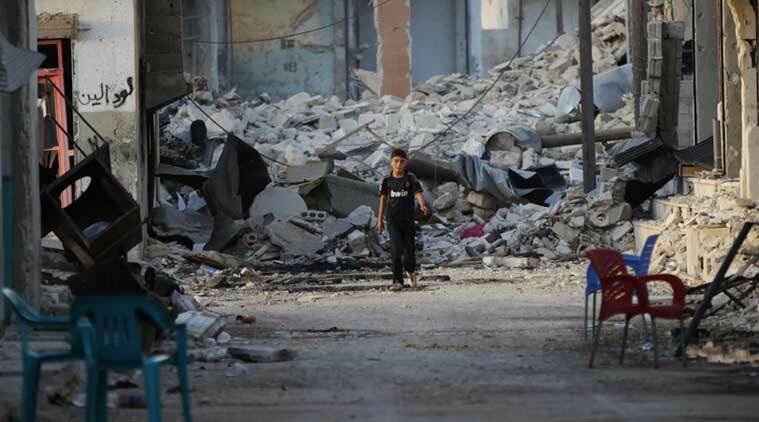 Perhaps, the piles of rubble on every street corner, the eerie silence in its streets during mid-day, its children not daring to play outside in the yard, the sound of explosions and shootings calling for the citizens to flee for their lives. Syria stands as a testament to Power, without the People. Chapter 1. Finding your Vortex Collision | Welcome to Billy’s story. Chapter 1. Why Ashmita won’t eat (and how to make her!) | Welcome to Ashmita’s story. Two are better than one. Join Sowers Today! Sowers is inviting writers, filmmakers (shorts) and storytellers to partner with us on projects. We believe in teamwork and encourage you to join us as we raise social issues and contribute to the community together. Algorithms are not arbiters of objective truth and fairness simply because they’re math.